Rapper Kanye West, winner of 9 Grammy Awards, has started a travel website, KanyeTravel.com. Kanye Travel Ventures will let Kanye's fans book airline tickets, cars, and hotel rooms along with, eventually, Kanye concert tickets all in one place. While celebrity brand-driven travel programs have been attempted in the past, none have demonstrated long-term viability due to the lack of resources, commitment, and expertise deployed by the management company and the endorsing celebrity. 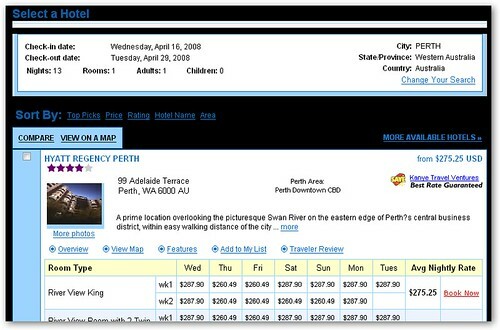 KTV, however, has been designed with Kanye and his executive team, and his energy and resources have been devoted to this innovative product offering. By securing industry expertise, partnering with global reservations systems, and negotiating high-volume discounts with air, lodging and ground transportation suppliers at varied price points, West Brands has assured that the KTV travel experience will reflect Kanye's style and approach to living. 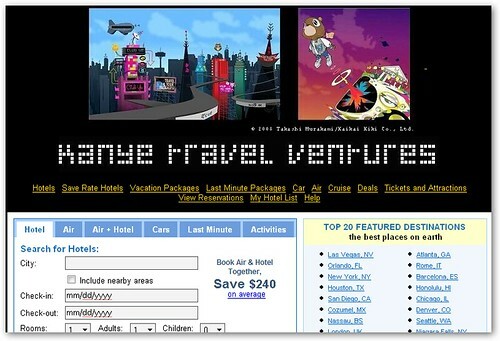 However, though the idea is to custom-tailor KanyeTravel.com to fit the needs and tastes of Kanye's fans, the travel website as it currently stands just slaps a Kanye West label onto a generic travel site, making it no different from traditional sites like Travelocity or Expedia. Hopefully, that changes soon. Kanye Travel Ventures is held through West Brands, LLC, which is a holding company owned by Kanye West.